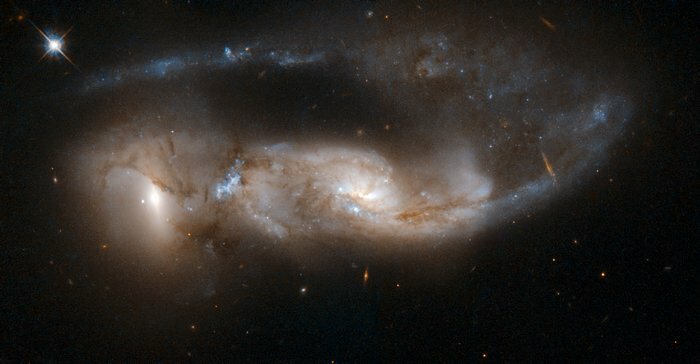 Arp 81 is a strongly interacting pair of galaxies, seen about 100 million years after their closest approach. It consists of NGC 6621 (to the right) and NGC 6622 (to the left). NGC 6621 is the larger of the two, and is a very disturbed spiral galaxy. The encounter has pulled a long tail out of NGC 6621 that has now wrapped behind its body. The collision has also triggered extensive star formation between the two galaxies. Scientists believe that Arp 81 has a richer collection of young massive star clusters than the notable Antennae galaxies (which are much closer than Arp 81). The pair is located in the constellation of Draco, approximately 300 million light-years away from Earth. Arp 81 is the 81st galaxy in Arp's Atlas of Peculiar Galaxies. Position (Dec): 68° 21' 47.43"